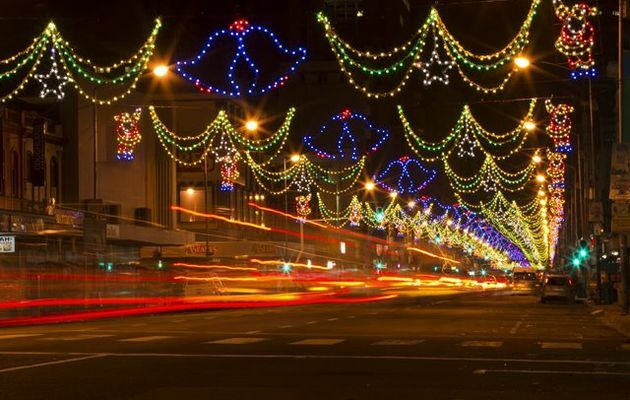 Christmas lights in Cape Town. Christmas Day, celebrated on December 25 in Catholic, Protestant, and most Orthodox churches, is a public holiday in South Africa. On this day Christians commemorate the birth of Jesus Christ in Bethlehem. The date is traditional and is not considered to be the actual date of his birth. The story of Christ's birth has been handed down for centuries, based primarily on the Christian Gospels of Matthew and Luke. Historians differ about when Christians first began celebrating the Nativity of Christ. Most scholars, however, believe that Christmas originated in the 4th century as a Christian substitute for the pagan Festival of Saturn celebrations of the winter solstice. Christmas is the only remaining Christian event which virtually the whole world acknowledges. Albeit it is celebrated world wide, it has largely lost its Christian character and is now often focused on goodwill and celebration with friends and family. Gift-giving is a near-universal part of Christmas celebrations. The giving of presents was used by Christians around the world to proclaim the Good News of the real Gift, the Christ Child, who was born to die and give us the gift of pardon from sin and eternal life. Presently, it is typically the largest annual economic stimulus in South Africa and other countries. According to Sainfo's latest article on South Africa's demographics, in terms of religious affiliation, about two-thirds of South Africans are Christian, mainly Protestant. They belong to a variety of churches, including many that combine Christian and traditional African beliefs. Many non-Christians espouse these traditional beliefs. Other significant religions are Islam, Hinduism and Judaism. There are increasing attempts to 'deChrist' Christmas. Many companies do their best to avoid the word Christmas and will rather refer to Season's Greetings. This is a controversial topic as 'deChristing' Christmas will aggravate many Christians and open up debates about other religious holidays.